Our Saturday morning walk began with our now regular practice of scanning the fields. Canada Geese were gathering on the parade grounds, so I held the group back and watched the Geese arrive. 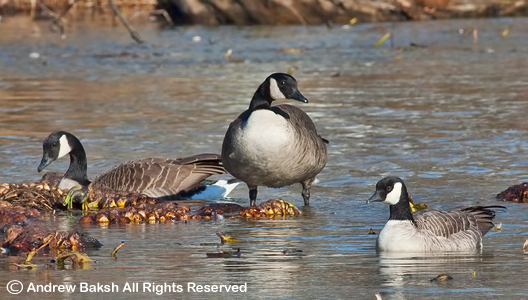 The numbers seemed more than what we had seen in the past few weeks, so I was optimistic of finding something new...perhaps a Cackling Goose. 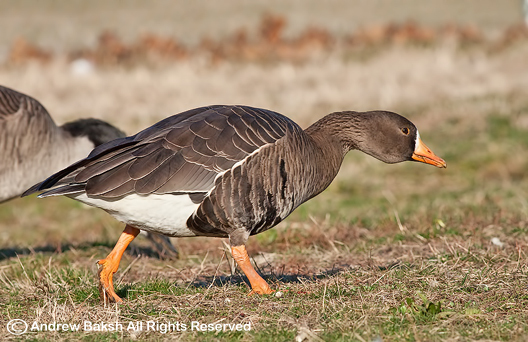 As we moved onto the field to get a better look, I spotted a Greater White-fronted Goose (Anser albifrons) flying in with the flock. I was elated! The GWFG was still here after all. We had missed this bird the last few weeks and our thoughts were it had moved on since no one had posted about the bird, but here it was. 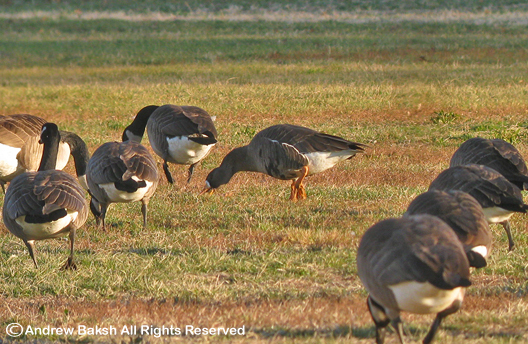 We had a great opportunity to observe the Greater White-fronted Goose feed as there was very little activity on the field and that allowed the Geese to roam without any concern. After spending some time observing the flock and scanning for Cackling Goose, which we did not find we began our hike around the VC lake. Here and there we picked up a few passerines, but nothing unusual. Waterfowl numbers were very low and only a few Hooded Mergansers (Lophodytes cucullatus) were of note on the lake. Bird seed near the bridge by the golf course brought in a few of the usual suspects and the group enjoyed close up views of Red-bellied Woodpeckers and White-breasted Nuthatches. We completed our loop of the lake and headed towards the restoration area where a female Cooper's Hawk (Accipiter cooperii) provided us with great looks. Passerine movement like last week was slow and so we ended our walk soon after with 26 species. See below for a complete list. 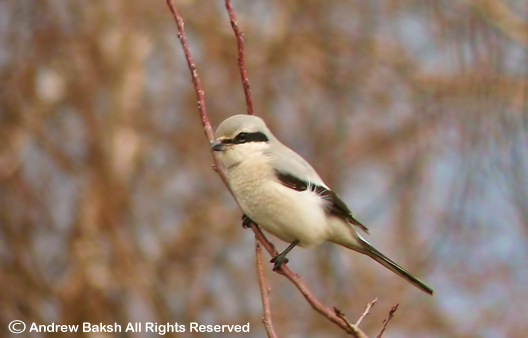 Digiscoped Northern Shrike at Floyd Bennett Field Brooklyn NY. A small group of birders met at our usual spot - the nature center near the parade grounds, for our Saturday bird walk at Van Courtlandt Park in the Bronx NY. 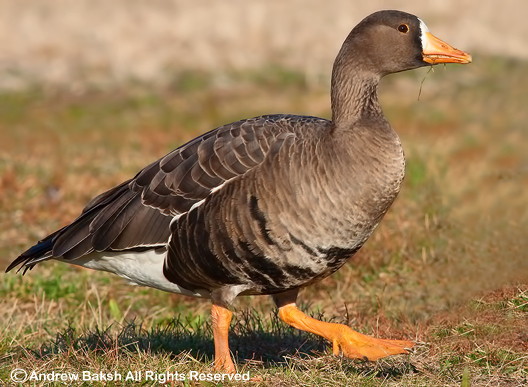 We began our walk by scanning the fields for a Greater White-fronted Goose (Anser albifrons), which we did not find and our thoughts were that this bird had moved on. We did have two Snow Geese mixed in with the Canada Geese on the field. 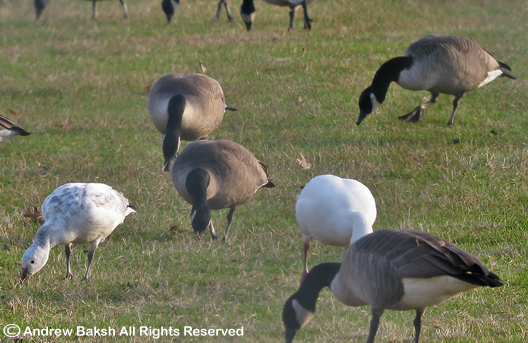 The two Snow Geese were new for our walk and we took some time to observe them feeding on the field. It was a nice day not too hot or cold and so I decided we should venture out to the North Woods. We worked our was past the stables finding very little passerine movement. It remained quiet until we made some headway into the Gass Gallagher Trail in the North Woods and then we picked up some action. A couple of Yellow-bellied Sapsuckers put on a brief show for us and we got on another first for the walk in a Red-shouldered Hawk that was soaring high above the trees. Later, as we looped back on the trail we added some additional passerines, but nothing out of the ordinary. Our favorite spot, the restoration area which is always good for a few birds was disappointingly quiet and after about 3 and half hours of birding we called it a day finishing with 27 species. See below for a complete list. Many of my readers have asked about nature gift ideas for the holidays, so I have decided this year, I will feature a couple of posts promoting alternative responsible gift giving. This post, features The Nature Conservancy in promoting their campaign to encourage holiday shoppers to buy gifts that give back to nature. 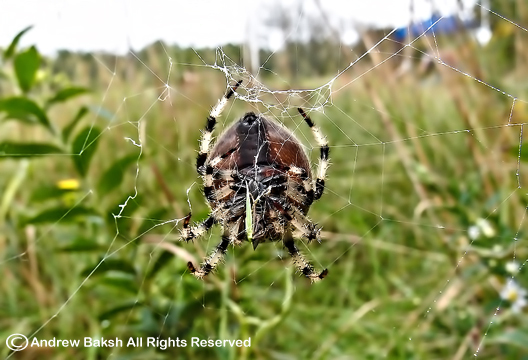 Don't just talk about giving back to nature here is an opportunity to ACT! Your loved one will be helping to protect 400,000 acres of rainforest of the Oso Peninsula, home to at least half of Costa Rica’s wildlife, including jaguars, sloths, tapirs, macaws and four species of monkey. 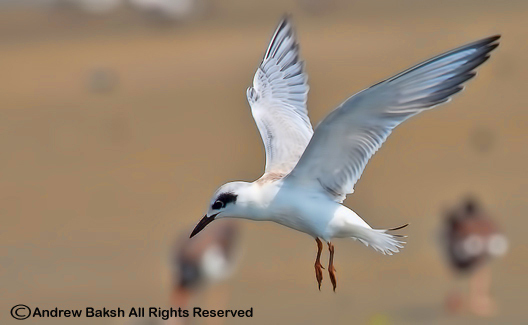 This gift contributes to the preservation of an area of important biodiversity. 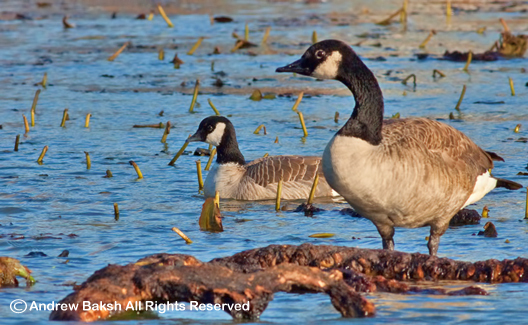 Give your favorite bird lover a gift that will help restore birds’ habitats in places like the forests of the Southern Coastal Plain, the prairies of Minnesota, and in wetland habitats where the endangered Whooping Crane lives. Your loved one will receive our Great Places E-Newsletter and invitations to take part in local field trips. Children love sea turtles and with this gift, they’ll be protecting these amazing creatures wherever The Nature Conservancy is working to insure their safety. Your recipient will receive an adorable sea turtle plush toy, local conservation updates, invitations to join in on field trips, and discounts from eco-friendly retailers. Help preserve this pristine 80 million acre home to wolves, grizzly bears and other amazing animals. This gift includes the Adopt an Acre magnet set and fact sheet that details our conservation work, and four issues of Nature Conservancy magazine. Part of The Nature Conservancy’s Plant a Billion Trees campaign, this gift contributes to our efforts to plant one billion native trees in Brazil’s Atlantic Forest. This program will help to restore 2.5 million acres in the world’s largest and most endangered tropical forest. 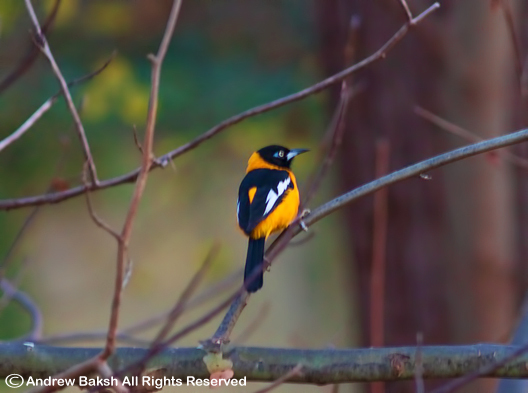 I received a call from Eric Miller this afternoon who indicated that our friend Mary Normandia had seen a strange looking Oriole at Gerry Pond Park in Roslyn NY. 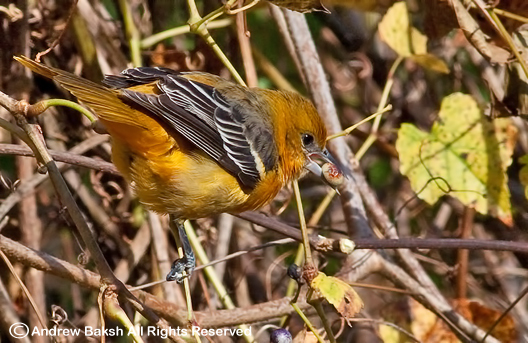 Eric went to check out the bird and realized it was not one of our common Orioles, but was unable to nail down the ID. When I spoke to Eric and understood that the bird was yet to be identified, I decided we had to get photos of the bird to review. I arrived at the location with light fading, but managed to see the bird and get some documentation photos. Later, I received a call from Eric who had figured out the ID. 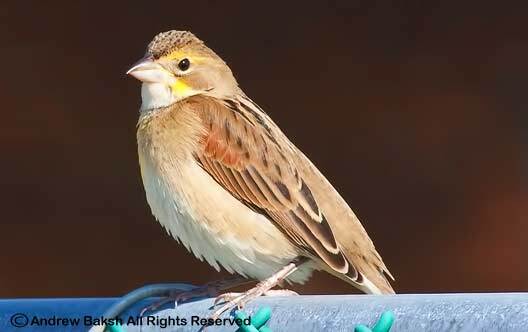 It was a Troupial (Icterus icterus), a bird from Venezuela; it is also found in Puerto Rico, the Virgin Islands (St. Thomas, Water Island and St. John), Antigua, Dominica and Grenada as a result of introduction. I am sure how this bird got here will be discussed, with many to chalk it up as an escapee. In any case it is a very good looking bird. 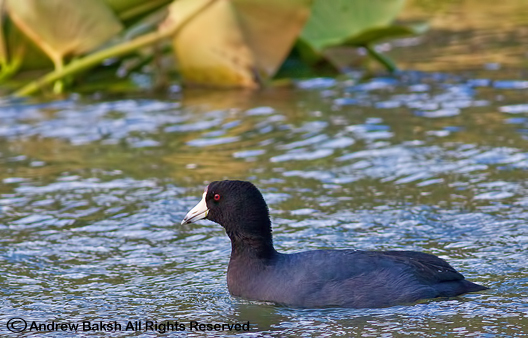 If you do try to go and see this bird, please refrain from chasing it around to get "spectacular" photos or to get that "good look"; stay at a respectable distance thus, allowing others to have a chance at seeing this bird. 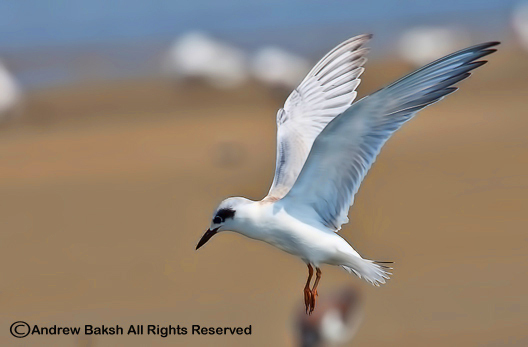 Other than those days when a good migration flight occurs, it is the time of the year where on some days birding could get slow. However, there are birds around as evidenced by the number of rarities being reported; plus, there are few not so rare but still good birds to get late in the season like the ones I found last week in the Bronx. After my Van Courtlandt Park walk last Saturday, I decided on continuing to bird the Bronx. 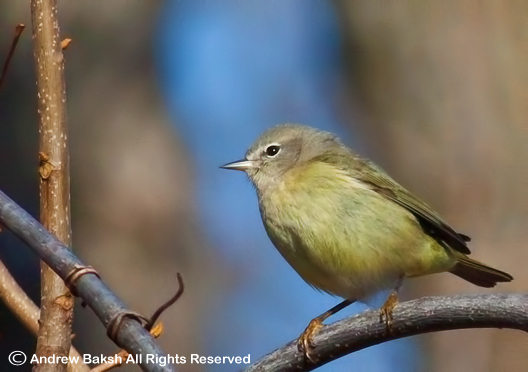 My first stop was at Pelham Bay Park where after a bit of poking around I found a very cooperative Orange Crowned Warbler (Vermivora celata). This was a first for the Bronx for me and I was pleased as it was one I was looking for. After getting a few photographs and observing the bird feeding, I scoped the cove for a bit finding both Red-throated and Common Loons. After making a few passes and counting the waterfowl, I decided to leave. On my way out, I decided to bird the same area where I had the Orange Crowned Warbler, the habitat looked promising and so I went off trail poking around. My hunch paid off; About 20 minutes into my exploration, I spotted some bird activity in the distance, they were American Robins. I got excited because they were more Robins than I had seen in awhile (yes, I still appreciate all of the common birds). Closing in on the location, I realized that they were active near a patch of Porcelain Berries. As I stood watching the Robins feasting, a bird that was not a Robin flew into a nearby section of the berries and began to eat. 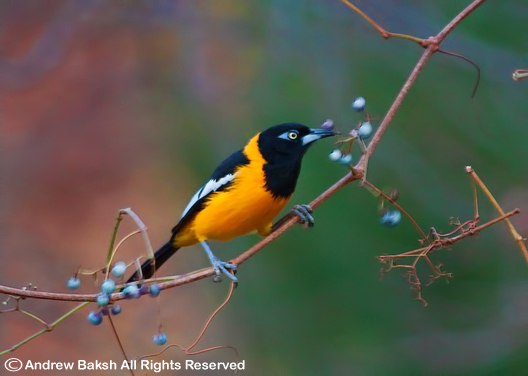 It was a Baltimore Oriole (Icterus galbula). I put the scope up and began to get some digiscope shots. This was a good bird to get this late I was thinking. 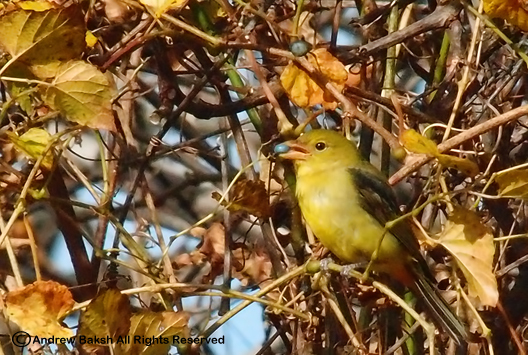 Then as I continued to bird the area, I found 2 more Baltimore Orioles and a surprising female Scarlet Tanager (Piranga olivacea). The later was quite the surprise and I carefully reviewed the field marks to ensure that I was not looking at a vagrant Western Tanager. All of these birds were seen in close proximity to each other in an area that had a lot of Porcelain Berries, an invasive by native plants standards, but nevertheless a valued food source for the birds. Having some success at seeing these birds this late in the season, got me to thinking about how much work is still needed to understand our own local patches and realized that I've got my work cut out for me. Later on at Orchard Beach in the Bronx, my highlights were a Red-necked Grebe (Podiceps grisegena) working offshore in the midst of a couple of Horned Grebes and a Peregrine Falcon bathing in a puddle in the parking lot. I got to Van Courtlandt Park before our walk to scout out the Greater White-fronted Goose (Anser albifrons), that we had last week. I wanted to ensure that if it was still around we had a shot at seeing it again. Sure enough, the bird was in the North West corner of the parade grounds in the fenced in area. Once our group assembled, we keyed in on the GWFG enjoying close up views. 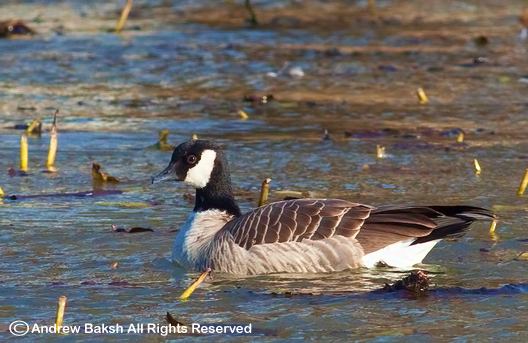 After we had our fill of the Greater White-fronted Goose (Anser albifrons), we then headed towards the VC Lake. We moved quickly with a purpose; there was a cross country event taking place, so we were trying to get ahead of all the running before the birds were flushed. Near the marsh, we had quite a number of wet spots good for Snipe, but did not find any; I am willing to bet that all the cross country running through the trails does not help at all. I wish that some of these trails were off limits to running as it would be less disturbance for the wildlife. We took one of the back trails around the marsh working our way towards the lake; the rattle then flight of a Belted Kingfisher alerted us to its presence and a flock of flyover American Goldfinches were all the action we had on that trail. 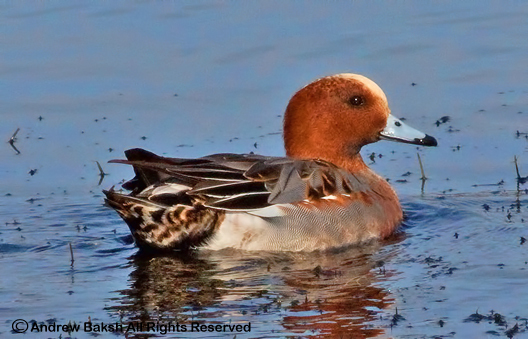 Once at the lake, we scanned for waterfowl and picked up Northern Shovelers, Ruddy Ducks and Pied-billed Grebe. We then backtracked around the marsh area taking another trail that would bring us near the golf course. We picked up a Male Hooded Merganser as it took off from near the shore and shouted out to another birding group (Brooklyn Bird Club), to get on it - they did. Continuing on we picked up American Coot and Green-winged Teal tucked up against the phragmites. Both birds were well hidden and it was not easy to see them but putting the spotting scope on the birds, I was able to get most folks on the two. 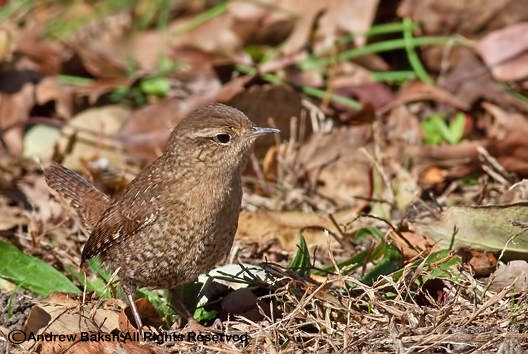 We continued on making our way back out towards the parade grounds, picking up Winter Wren, and some other dickie birds. 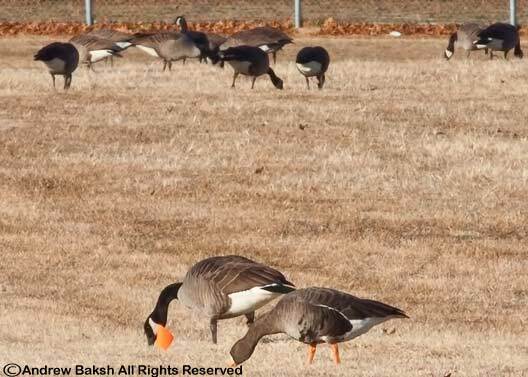 Once at the parade grounds we looked carefully for the Greater White-fronted Goose (Anser albifrons), but the Canada Geese flock had gotten smaller and the GWFG was no longer on the field. This was too bad as one of our attendees who missed it by arriving late the previous week missed it again because of arriving late - got to get to the walks earlier Lenny. From the parade grounds, I took our group to the restoration area where we picked up many birds working the wet grounds. 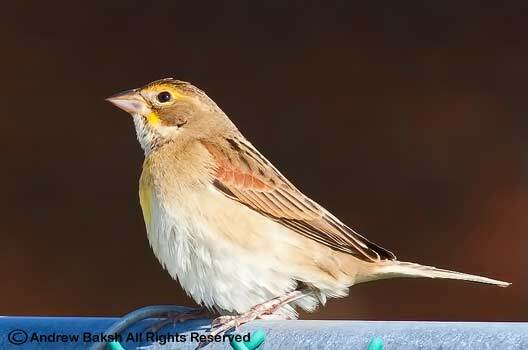 Our best bird from that area was a Field Sparrow, a first of the season for the group. In the end we managed 37 species. See below for a complete list. 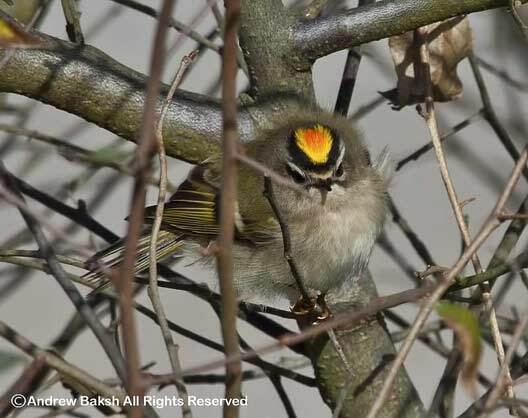 Male Golden-crowned Kinglet (Regulus satrapa) showing the seldom seen orange in the crown. After a disastrous shorebird season and a lack of rarities at Jamaica Bay, we finally had a decent bird in Eared Grebe (Podiceps nigricollis). Found initially by Anne Lazarus and her group. 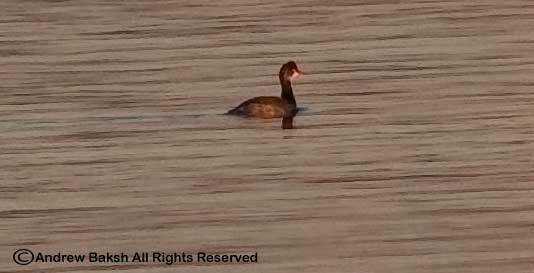 The Eared Grebe was re-found and its ID confirmed by Patrician Lindsay, Steve Walter and I on November 5th. I was able to get a documentation shot of this Grebe on the bayside of the West Pond as it associated with Horned Grebes (Podiceps aunitus). Our Van Courtlandt Park group met up at our usual spot, the nature center near the parade grounds. 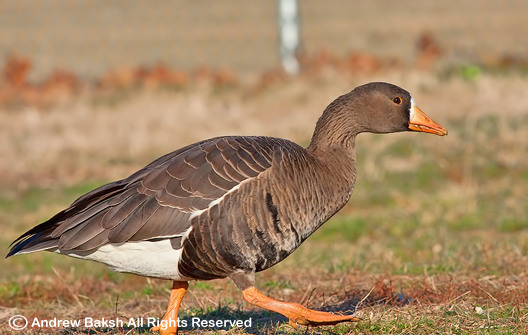 We began our walk by scanning the fields for a Greater White-fronted Goose (Anser albifrons) that was seen earlier in the week at the park. 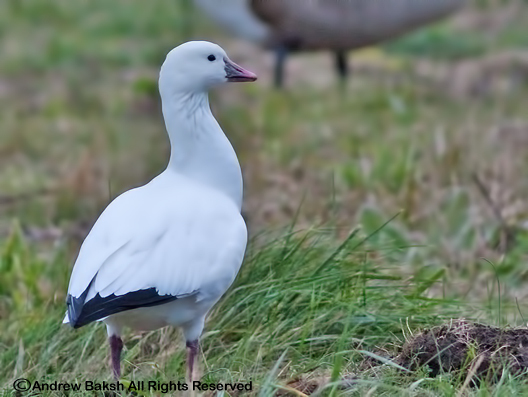 On our first pass, we did not find the GWFG; however, as we crossed the field heading north east towards the Van Courtlandt Park Lake I decided to scan the furthest end of the field and found our bird. The Greater White-fronted Goose was tucked in behind a couple of Canada Geese and it was the leg color that alerted me to its presence. Soon it came out into view and I got everyone in our group on the bird. It was pretty exciting for our group since none of them had seen one before. Jennifer a new attendee was especially thrilled at seeing a GWFG for the first time. After having our fill of the GWFG, we birded along the lake adding to our day list. While the birds were not plentiful we added a bird here and there. A Hairy Woodpecker (Picoides villosus) teased us with fleeting looks and a White-breasted Nuthatch came in and stole the show, enthralling everyone with closeup views. 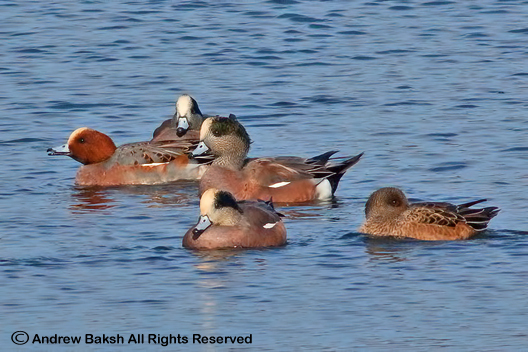 A couple of Pied-billed Grebes (Podilymbus podiceps) on the lake were new arrivals along with a couple of Ruddy Ducks (Oxyura jamaicensis). We worked our way back to the restoration area and noticed how many trees had taken a hit from the storm we had a few weeks ago. The marsh area in the restoration area was all matted down from the snow we had and there were very few birds there. 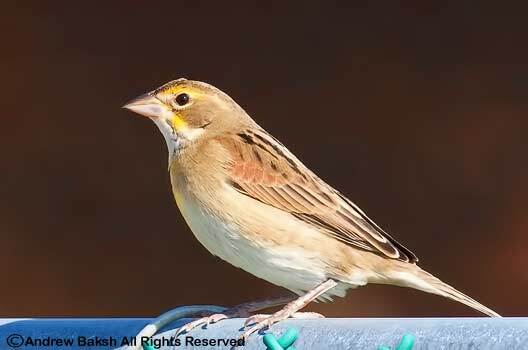 Nevertheless, we did manage to pull out a few Swamp Sparrows (Melospiza georgiana) and a Ruby-crowned Kinglet (Regulus calendula) from that area before wrapping up our walk. Despite a paucity of birds we managed 37 species. See below for a complete list. 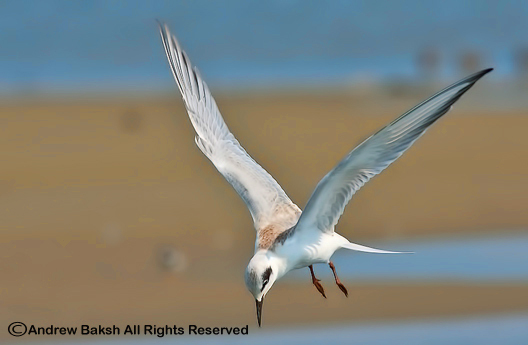 On October 23rd I posted a photo of a flock of shorebirds and challenged my readers to take a crack at identifying the species. 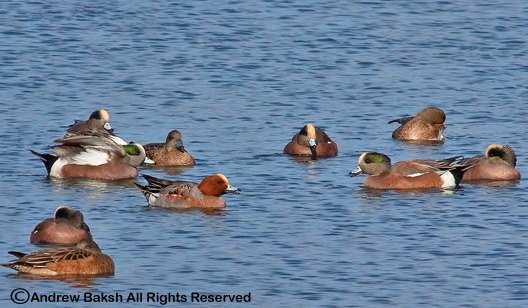 Here is the answer: There are 7 species in this flock of shorebirds. 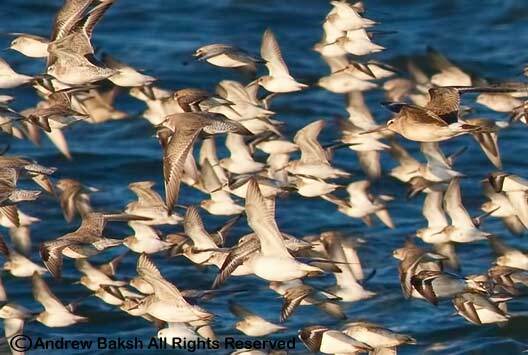 Sanderling, Red-Knot, Ruddy Turnstone, Dunlin, Black-bellied Plover, American Golden Plover and Hudsonian Godwit. Now, that I have listed the species and provided a cropped photo for a closer look, the juvenile Hudsonian Godwit is now easily seen. 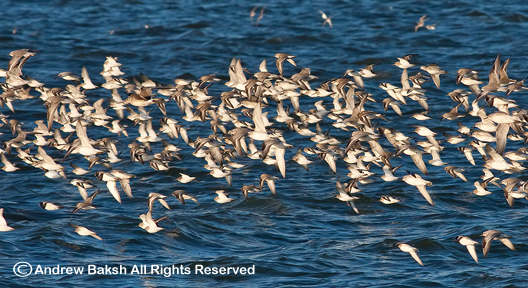 Try and see if you could find the others; the American Golden Plover is in this cropped photo.